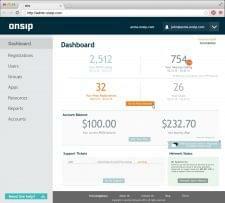 In the world of cutting the cord and simplifying everything, OnSip has nailed it! They make everything incredibly easy and streamline to switch over from the plain old telephone lines and systems that are outdated with no features, they even have tech support that answers on a holiday Sunday when I needed it!!!! I LOVE THIS COMPANY, if only every company was manage and run as good as this the word would be a better place. In the world of cutting the cord and simplifying everything, OnSip has nailed it! They make everything incredibly easy and streamline to switch over from the plain old telephone lines and systems that are outdated with no features, they even have tech support that answers on a holiday Sunday when I needed it!!!! I LOVE THIS COMPANY, if only every company was manage and run as good as this the word would be a better place. I’m using them with the Panasonic KX-Utg300B with touch extension module, Onsip is the only company that I found that didn’t charge per phone to enable the extension module. I’m using 19 phones and our bill is between $124.00 a month all the way to $400.00 when we are in season (Florida). We have 3 locations, Even doing the hurricane it worked 100% and they are friendly on the phone. Note a competitor tried competing with their pricing and I did try them out and the service was $350 due to the charge per phone to enable the extension module on all phones good thing I had 90 days to cancel. and when right back to Onsip. DO NOT LISTEN TO ANY SIP PHONES SALES REP. they get paid commission and who ever pays them the highest commission is the service they are going to sell you. Pros: I DO NOT KNOW A COMPANY ON EARTH DOES 19 PHONES FOR $124 ONSIP IS THE BEST. Cons: I really don't see any, unless you use a lot of minutes. Easy to use and can access the system from anywhere, using any device. We started using Onsip 4 years ago…. We started using Onsip 4 years ago. It was affordable and has a relatively easy configuration interface. Problems with their service began about 18 months ago when they upgraded their server side software and we lost the ability to answer our phones for two weeks ( routing all calls to mobile was a work-around to survive ). Roughly 12 months ago we could no longer have cell phones in any of our groups because then the group distribution would not work. This lasted two weeks again. Then 6 months ago, we had ghost routes that would call forward calls to non employees even though we removed all possible routes. Their support repeatedly claimed that we had forwarding on the phone itself then admitted it was on their end, you guessed it, two weeks later. Finally, it appears that they have been collecting city tax for some three years even though we do not operate in the city. $300 gone. Disappointing, since they seemed so advanced in the beginning. Shopping around for another provider now. Pros: Web interface easily configured. Cons: Bugs, inexperienced support, not reliable. Pros: Easy to use, when needed, technical support is experienced, no issues usually. Cons: don't have DIDs in the rate center that I live in. OnSIP is a product of Junction Networks, but if you just call them “onSIP,” they won’t mind. With over 40,000 businesses OnSIP is one of the top hosted VoIP PBX providers. They have redundant colocation centers, one in Manhattan, the other in Los Angeles. Calls are routed to use the H.323 communication standard whenever possible, which means the best sound quality. They offer one of the most flexible platforms, and have a simple API for developers to add applications of their own. That said, for any business owner that wants simplicity and reliability, the platform manages to be both intuitive and crammed with features. OnSIP may seem intimidating at first because the plans require you to examine how much you use the phone, rather than treat it like a water tap. However, if you’ve ever complained that your cable company (or any other service) charges you for features or channels you’ll never use, this is what you’ve asked for. OnSIP has both a proprietary phone software that is top-tier, and a platform that can be used on any device capable of using the Session Initiation Protocol. Having this option is great if you prefer any non-traditional operating system or one of the less popular mobile devices. As with any VoIP provider today, you get so much more than just a way to make phone calls. You get all sorts of integration with third-party CRM and help desk software, and their own applications as well. With OnSIP, you can communicate by audio, video, or text with any of your colleagues, or even with a new contact visiting your web site, and all with no software to load. Finally, it’s worth reminding you that the system is optimized for an all-IP experience, but it will connect to any phone number in the world. US-based support 9 am to 8 pm ET, Monday-Thursday, 9 am to 6 pm Friday. Call 800-801-3381 (Then press 2, 1). While on hold, you can leave a voicemail and the staff will get back to you, rather than wait in the queue. For off hours, customers can leave a voicemail or create a a ticket—in the case of service interruptions, engineers are notified and may contact the customer immediately. Other issues are resolved starting the next business day. Live webinars with Q&A are held twice per week. The web site has extensive tutorials and FAQs. Insta-Call: A variation on Click-To-Call that lets visitors start a video call when browsing your web site. Auto-Attendant: Commonly called a Phone Tree, this software directs calls to the right extension or number. Groups: Also called Ring Groups or Hunt Groups, this feature typically sends calls to an entire department and whoever is available can answer the call. Great for inbound sales. Dial-By-Name Directory: Inbound calls can be directed to an extension that matches up with the first few letters of the agent’s name. Ideal for when new contacts don’t know your extension number. ACD Queues – The Automatic Cal Distributor can customize how an inbound call is routed; it is used to best match up the caller’s issue with the agent who can best solve it. 911 – Modern VoIP providers are required to route 911 calls to emergency contact centers, and the call will send location information to the operator. Inbound Bridge – If an onSIP subscriber can find a better deal on toll-free calling than they offer, onSIP will connect calls from that provider, while still providing superior PBX and standard calling service. This feature is most suited for international toll-free calls. Phone Numbers – New subscribers can choose a new local or toll-free number, or choose to keep the existing number. Voicemail-to-Email – Sends a copy of your incoming voicemail messages to your email. You don’t even have to log in to listen to your messages. Announcements: Leave a short message for your callers without letting them leave a message. Most businesses use this feature to announce their business hours and directions. Find Me Anywhere – Ring multiple phones (home, desk, home office, cell phone, hotel room) to make sure you never miss a call. Business Hours Rules – Configure two sets of calling rules for different hours. For example, when you are closed, all calls go to voicemail. This can be customized so certain numbers get through anyway. HD Calling – Also called HD Voice, or, more technically, Wideband Audio, this widens the frequencies that your phone can transmit, so your voice sounds more natural and clear. 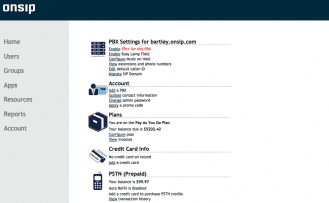 Busy Lamp Field – This handy feature lets you know if another extension is already taking a call. Enhanced Music on Hold – No one likes being on hold, but this feature eases the pain with your choice of your own music or one of 100,000 streaming music channels. HD Conference Suite – Meet the future of conference calling with multiple participants that all dial in to one number. HD Voice means you’ll be better able to whom is speaking. Paging – Use the speaker on every desk phone to send a message to multiple people at once. Personal Ring Strategy – Have all your phones ring at once or one at a time. In-Network Calling – Call any onSIP phone anywhere in the world for free. $0 to start: Pay for features & calling as you go. What Do You Think of OnSIP?